Many people get their start in the ancestral health/evolutionary wellness world through food. Be it “paleo” or “primal” (or perhaps the ever practical advice of Dr. Emily Deans: “Don’t eat like a Jerk”), most people start this journey with food, and then start to apply the evolutionary mindset to other aspects of life. Once the logic of “eating evolutionarily” sets in (and once you realize how good you look and feel while doing it), you might start to apply the evolutionary approach to other aspects of your life. The jump from an evolutionary approach to food to barefoot running is an appropriate one. The evolution of the foot (and our ability to run) is often traced to the human ability to run down prey, and thus the evolutionary argument that meat is an important part of an appropriate human diet. From an evolutionary health perspective, the argument that “these feet were made for moving” (without the help of massive rocker-bottom shoes) just starts to make sense, and might just prevent (or explain) injury. If you’re not familiar with the arguments for a barefoot approach (or if you are, but haven’t seen this video), I highly recommend the following brief video, made to accompany this paper , in the eminent journal Nature*. It certainly makes sense that a forefoot foot strike pattern inline with our evolutionary “design” might be protective against running-induced injury. Indeed, a small retrospective study that was published this July showed exactly that. 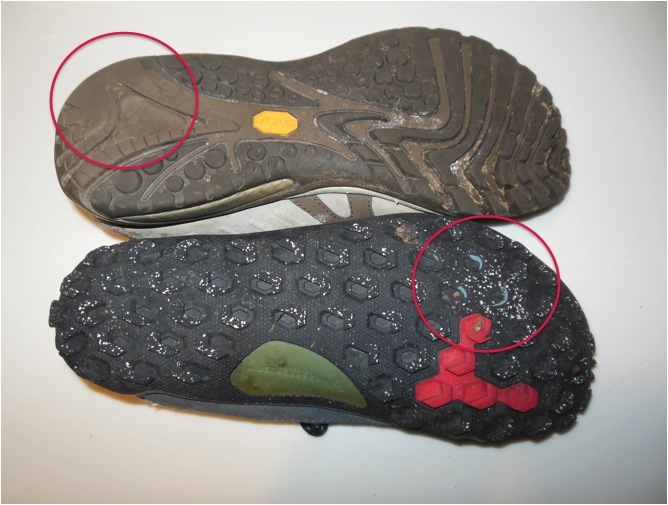 In cross-country runners, those with a forefoot foot strike had significantly less repetitive stress injuries than their rearfoot-striking counterparts . 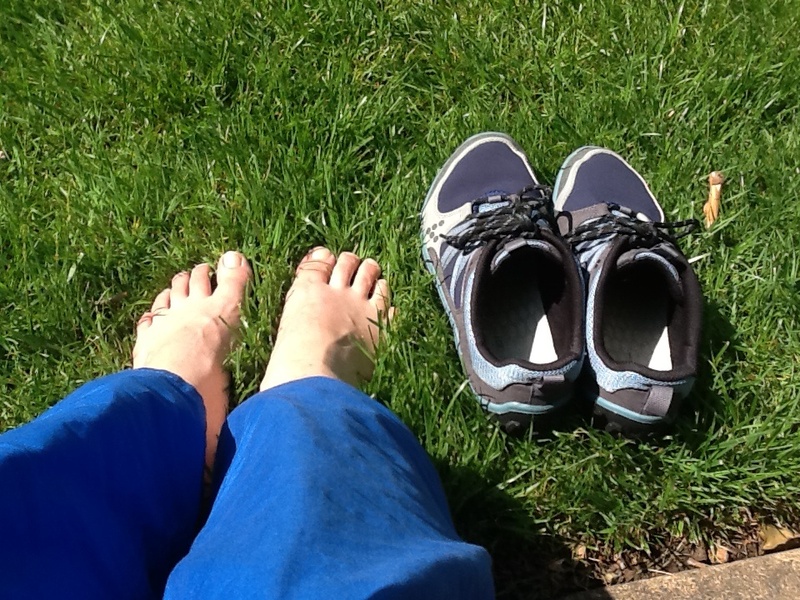 Embracing the barefoot message does not mean you have to embrace actually going barefoot. You can see from the VFF link above that there are options for those who want the barefoot experience without the unpleasant effects of doggie-doo. For those worried about being labeled part of the monkey-foot army, have no fear- there are minimalist options out there that are relatively indistinguishable from *regular* footwear. In the last few years there’s been an explosion of minimalist or “barefoot” shoes. Those in the market can chose from a number of mainstream or more esoteric brands. From New Balance Minimus Zeroes and Merrel Gloves to Vivobarefoot and some of the Inov-8 options, there are many options for the barefoot enthusiast to try. I’m not here to write a review of the Vivos I’ve been wearing (though they’ve been great for me). My advice for anyone looking to explore minimalist shoes is to go to a store and try on the different options. I know some people love the Merrel line, but they’re definitely too narrow in the arch area for me (they leave me feeling like I’m in shoes with big arch support). I want to try the NB Mimimus Zeroes (the newest NB “barefoot” option with no heel drop) before I purchase my next pair of sneakers. Shopping for a new pair of sneakers is definitely on my mind, as I’ve recently realized that my original pair of Vivos is on the way out. They’re had a good run, but some of the luggs are now totally worn down, and the sole is starting to erode too. I hadn’t noticed in the way they wore, but when I flipped them over I was initially surprised to see where there was wear. Ever since I was a kid I’ve been “hard” on sneakers. I’ve worn through the soles of many shoes (and stomped down the back of many an unlaced sneaker- much to my parents chagrin). In the past, I’ve always noticed that it was the heels of my sneakers’ soles that went first. With my Vivobarefoots, the wear is only prominent at the ball of my feet. I dug up an old pair of sneakers (not worn out, as I switched over to minimalist options before these were done) and you can clearly see that the greatest wear is in the heel areas. Yes- there is some wear in the toes, but not much. For contrast, look at my ailing Vivos. The different wear patterns in my last pair of normal Merrels and my minimalist Vivobarefoots. For me, this is pretty convincing evidence that minimalist shoes do, in fact, encourage the midfoot strike that is desired by those that go barefoot. That’s not to say that minimalist shoes are a cure-all for heel striking. You can check out this video from the 2011 NYC barefoot run to see the variety of footfall patterns- many of those with minimalist shoes have a different footfall from the truly barefoot, with a couple examples of heel-striking in minimalist shoes… ouch! Lunch/sun break on a sunny day on my surgery clerkship. Usual disclaimers apply- minimalist shoes are not for everyone. Getting accustomed to minimalist shoes can take time. Consult a medical professional before starting any exercise regime. Go in search of the Wizard of Oz (NOT DOCTOR OZ!) if you are in need of your own brain. *For those keen on reading more about evolutionary medicine, Daniel Lieberman published an article on evolutionary medicine and barefoot running in April . 1. Lieberman, D.E., M. Venkadesan, W.A. Werbel, A.I. Daoud, S. D’Andrea, I.S. Davis, R.O. Mang’eni, and Y. Pitsiladis, Foot strike patterns and collision forces in habitually barefoot versus shod runners. Nature, 2010. 463(7280): p. 531-5. 2. Daoud, A.I., G.J. Geissler, F. Wang, J. Saretsky, Y.A. Daoud, and D.E. Lieberman, Foot strike and injury rates in endurance runners: a retrospective study. Med Sci Sports Exerc, 2012. 44(7): p. 1325-34. 3. Lieberman, D.E., What we can learn about running from barefoot running: an evolutionary medical perspective. Exerc Sport Sci Rev, 2012. 40(2): p. 63-72.